We should not assume the #CancelColbert hashtag let Dan Snyder off the hook. Did the “#CancelColbert” hashtag and subsequent uproar really, as so many are saying, let Washington football team owner Dan Snyder off the hook? Did protesting Stephen Colbert’s at best tired use of anti-Asian satire really take all the focus off of Dan Snyder’s wildly offensive “Washington Redskins for Original Americans” foundation, and thereby do him a colossal favor? So many are saying “yes” to this that it seems to be becoming a self-evident fact, but to really answer this question, you need to know something about Dan Snyder. One of the great curiosities throughout the Washington DC area is Snyder’s wealth. The official word is that he made his fortune through “communications” yet it strains one’s mental faculties to think of someone who has ever been worse at communicating to the public than Dan Snyder. We all have our favorite Snyder gaffes, all mercifully catalogued by Dave McKenna, although nothing can match his aggressive and ill-fated effort to sue the Washington City Paper, ironically spurred by his belief that the City Paper’s cover presented him as a Jewish caricature. Yes, the owner of the Redskins attempted to drive a publication out of business for what he believed was a culturally insensitive cartoon. Snyder’s gaffes are impressive in their variety, yet most of them arise through his ham-handed, meat-fisted attempts to defend the use of “Redskins” as something other than a racist caricature. That was the good news for Snyder. Days after the announcement, it was revealed that the man Dan Snyder trusted to run his foundation, Gary Edwards, should not be trusted with much of anything. According to a 2012 report from the Inspector General of the Department of the Interior, Gary Edwards’s nonprofit, the National Native American Law Enforcement Association, was charged by the Bureau of Indian Affairs with the recruitment of 500 Native Americans for police and security training. He succeeded in recruiting none, despite spending one million dollars to do so. We at The Nation contacted Tony Wyllie, the PR director of the team. He just sent back a curt quote from Gary Edwards that read, “NNALEA believes it met and exceeded all of its obligations under the contract with the bureau of Indian affairs, office of justice services and subsequently was paid after the contract was completed.” Remember, Edwards did not supply one acceptable applicant. This latest gaffe only further shows that exposure is no friend to Dan Snyder. When Stephen Colbert mocked Snyder’s foundation using racist satire, and Suey Park started her #CancelColbert campaign in response after seeing Colbert’s disembodied, decontextualized tweet, a great many people slammed Park for directing people away from the issue of mascoting and toward her own issues/selfpromotion/ethnicity. Keeler is of course correct and it is difficult to not sympathize with her critique. It is also true that if everyone defending Colbert as a genius satirist of n racist name took a minute to email the NFL, we could get the name changed. But I also believe that politically, #CancelColbert brought more of Dan Snyder into the spotlight, onto news stations, and into magazines—like The New Yorker (brilliant piece by Jay Caspian Kang) and The Wall Street Journal—where discussion of his racist branding are not normally found. We can see clearly from the record that attention does Dan Snyder no favors I know for a fact that both the team and the NFL have had to deal with phone calls and queries from a new set of reporters asking them for comment about the entire situation. Sunlight is not Dan Snyder’s friend. In fact, it is the greatest disinfectant to everything rancid he has brought to the public discourse about Native American rights. Every bit of publicity that gets showered on the reality that we have a team branded with a racial slur chips away at Daniel Snyder's authority. If you think the NFL wants one of their brands at the heart of the story-of-the-moment, as well as a national discussion about whether or not “Redskins is as racist, more racist, or less racist, than an anti-Asian slur," then you do not know the NFL. 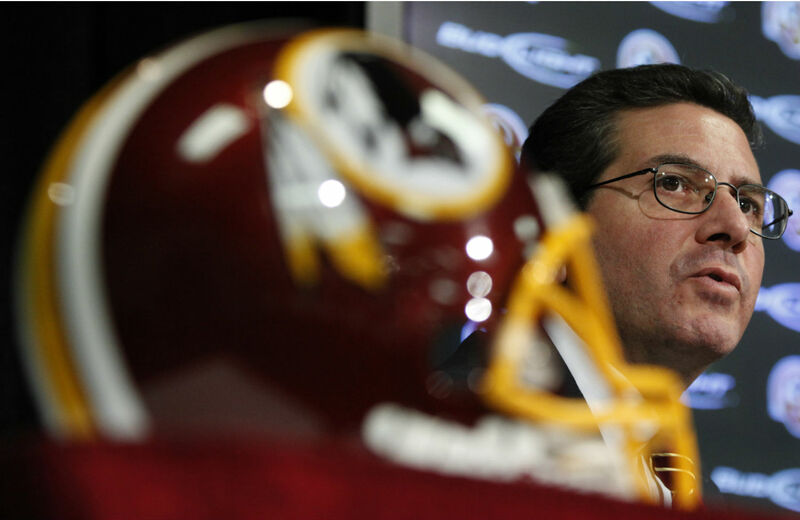 Dan Snyder is on the clock to change his name. In my view, the more the NFL hears that clock tick, the better.